It’s October 1st, which means the Halloween season has officially begun for me! So this seemed the perfect time to address what so many of you have been e-mailing and texting me about recently. Namely, the fact that it doesn’t look like I’m doing very much this year in terms of presentations, appearances, and ghost tours. The simple answer is that I’ve decided to take this October off for the most part. Don’t worry; I’m not going anywhere. Just taking a break to gear up for some craziness that’s going to pick up the first of the year and continue straight through next October, when all heck is going to break loose…in a ghostly good way! So that’s the simple answer. If you care for a longer, more in-depth explanation, then read on! I’ll even throw in a couple of random spooky pictures just to sort of break things up. Still there, huh? OK, then let me start by saying that I’ve been overwhelmed with the outpouring of e-mails I’ve received from people who appear to be downright depressed that they aren’t going to be able to see me this Halloween season. You guys touch me in all the right ways (and none of the wrong ways) and to you, I say “thank you”. Some of you have even said that you plan on boycotting some of the events/conferences/locations to show your displeasure at my not being there. Please don’t do that. Look, I appreciate the gesture, but to make it clear, not a single one of those events/conferences/locations asked that I not return. Across the board, it was my decision and mine alone. Since all of these events/conferences/locations depend on your attendance in more ways than one, I ask that you continue to attend and support them. And don’t think you’ve seen the last of me at those events, either. I’m taking a break, not going away. So why am I taking a break? For no other reason than I needed one. My upcoming project, the one I keep teasing the heck out of, took over 2 and a half years (and literally thousands of miles) to complete. While that was going on, I was still trying to keep the Halloween tour schedule running full-steam ahead and attempting to balance all that madness out with my personal life. 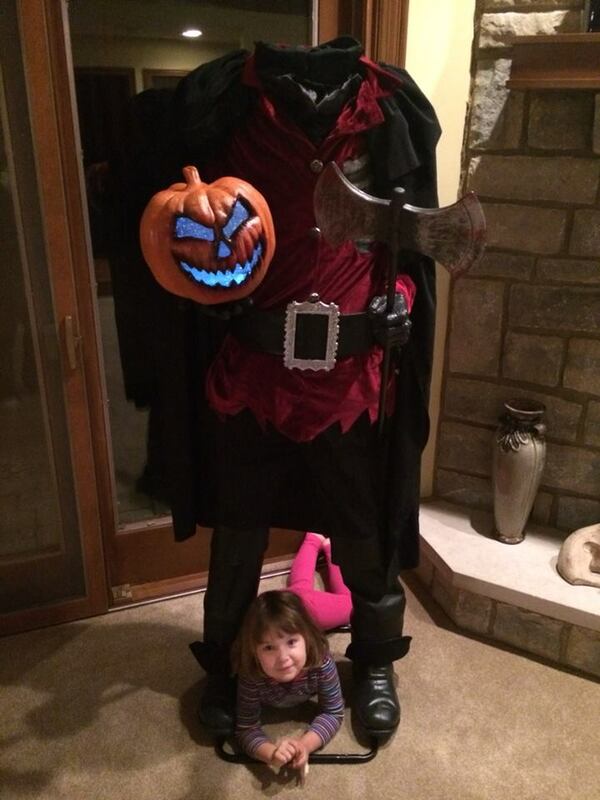 Late last summer, when the project was finally put to bed, I realized something that depressed the hell out of me: 3 Halloweens had passed and I had yet to take my daughter, Courtney, trick-or-treating. Courtney wears Batman stuff because he’s her “buddy”. 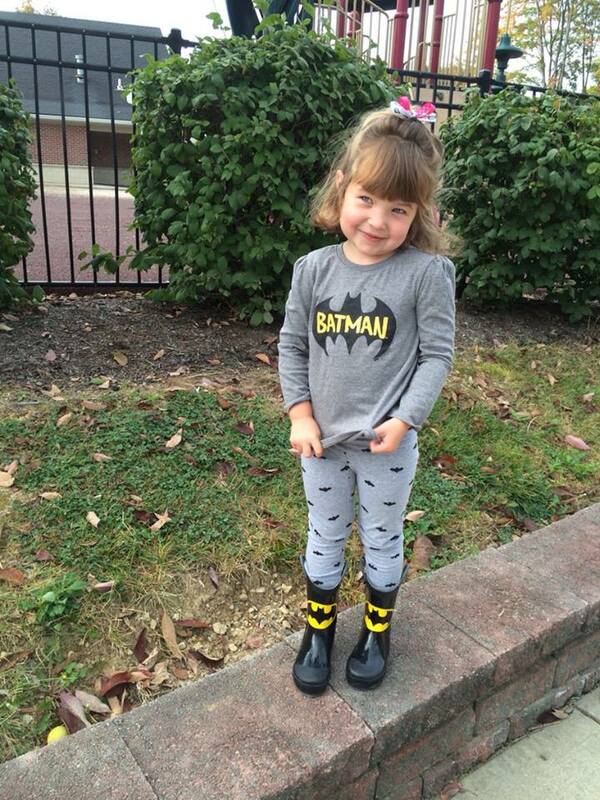 But for Halloween this year, she wants to be Batgirl. She also wants her dad to be the Riddler. I’m still trying to convince her dads are not supposed to wear spandex. Wish me luck! That’s right: James A. Willis, the self-proclaimed strange and spooky guy who’s addicted to all things weird has yet to take his daughter trick-or-treating. How sad and pathetic is that? Sure, I could try to blame it on Ohio’s asinine habit of randomly assigning what 2-hour window I’m allowed to celebrate Halloween during, but the simple fact is that it was usually because I was either hopping around some stage/auditorium/haunted house/carriage, entertaining everyone with tales of weird and ghostly things. And that was when I made the decision to take a break this Halloween season and focus on my family. I’m planning on taking Courtney trick-or-treating. Not only that, but as a family, we’re going to be carving a whole mess of pumpkins, decorating the house, bobbing for apples, watching It’s The Great Pumpkin, Charlie Brown on TV, and rolling around in the 25,000 pounds of leaves that fall in my front yard every year. In short, this Halloween, I plan on being nothing more than a strange and spooky father and husband. One of our latest acquisitions. After helping me put him together, Courtney asked if we could keep him in her bedroom. But I’m not going anywhere. Far from it. In fact, I would suggest that most of you take this opportunity to enjoy a break from me. Because come next year, you just might get sick of seeing my ugly mug. You see, the other reason I felt I needed a break was to sort of rest up for what is going to be nothing short of a strange and spooky assault on all of you in 2015. One that I’m sure you’re all going to enjoy: new projects, new appearances, and new presentation topics. Trust me, 2015 is going to be hopping around here! It’s probably going to start picking up right after the first of the year. By the end of the summer, things will more than likely be bordering on “strange and spooky overload.” Put it this way, if you or someone you know is planning on having me out for an October event, etc. in 2015, you might want to look at getting something confirmed with me before this coming summer. The sooner the better, too. To put things in perspective, my latest project involves 21 specific locations in Ohio and 20 of them have already expressed having some type of event in October of 2015. So do the math…and get excited because, as I said, you’re probably going to get sick of seeing my face in 2015! Contrary to popular belief, Steph and I really ARE wearing Halloween costumes in this photograph. Now, I’m sure those of you who have seen me live are probably chuckling as those descriptions, but it’s true: that’s what people who have yet to experience my Strange & Spooky World expect. That’s probably why most people walk away from one of my presentations muttering “I’m not sure what just happened, but it was fun.” Allow me to throw modesty to the wind here and state that since I first starting giving presentations in Ohio some 15 years ago, the only complaint I have ever heard was “it was too short.” Well, ok, one woman wrote to me and told me my stories gave her nightmares, but I take that as a compliment. I have always felt that my job, once I take that stage, is to entertain each and every member of the audience and to have them all smiling, laughing, and perhaps shrieking, by the time I’m finished with them. Preparing to unleash the video of my infamous Blue Flash video on Kenwood Elementary School. 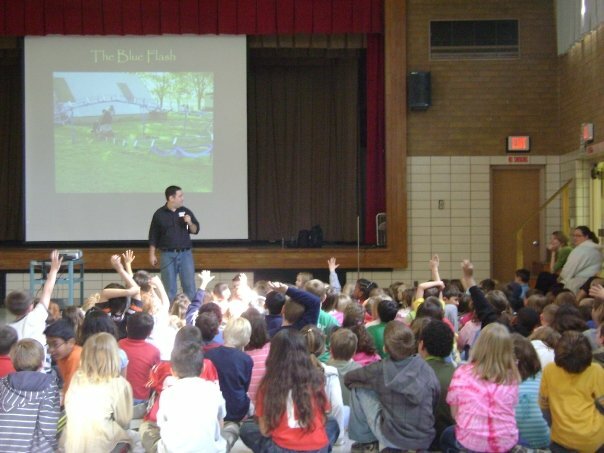 The kids with their hands up are the ones who said they’d be willing to ride the Blue Flash with me! But while people walk away happy after the presentation, there’s still some confusion among the general public about what to expect going into one of my presentations. So I have my work cut out for me, especially since I’m planning on upping my game in 2015. If you thought my presentations were over the top before, just you wait! 2015 is going to bring all-new topics, bigger and better photos, audio, and videos, and even special guests! I’m even looking into the logistics (and legalities) of incorporating lasers, t-shirt guns, and confetti cannons. Yes, I’m serious. 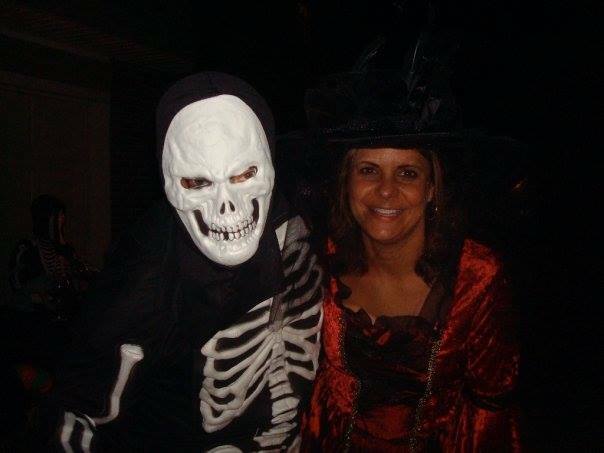 So please, get out there and enjoy the Halloween season this year. You’ll be fine without me, I promise! 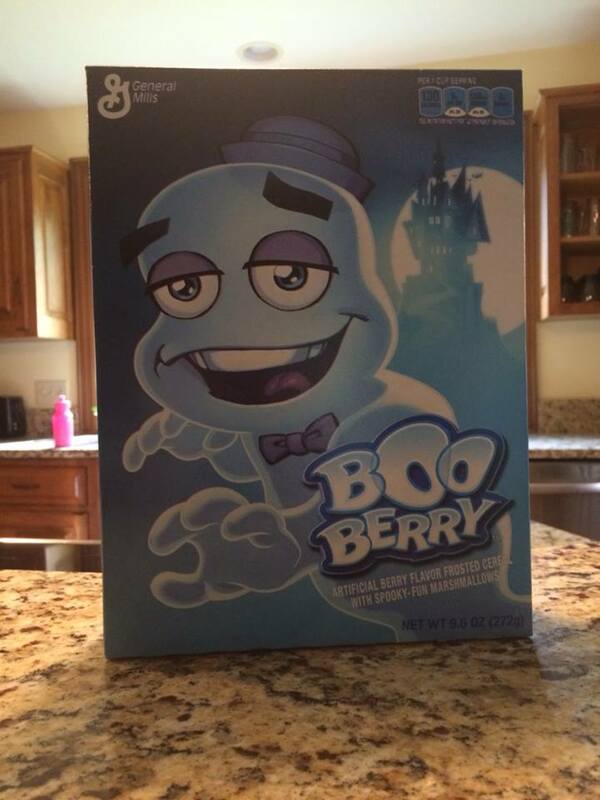 Just know that I’m busy stocking up on Monster drinks and Boo Berry cereal in preparation for next year! Excellent! Hopefully your travels will take you to NE Ohio. I’ve never seen one of your presentations but it sounds like 2015 will be a must see! Thanks for the note, John. And yes, it would appear as though I will be making several stops in NE Ohio next fall. Hope to see you there! Stay tuned!